GE Animation have been making good use of their Mega Man license with all sorts of little trinkets, posters and apparel. Now their looking to produce what is hopefully the first in a line huggable paraphernalia. It's soft. It's cuddly. It's downright adorable. It's the official Mega Man Powered Up plush. This little guy is due for distribution in late April. At present, we've no idea just how large or how small the plush is, so your guess is as good as mine. I imagine size will play a large factor in pricing, which has yet to-be-determined. GE Animation's Mega Man products tend to surface at specialty pop culture retailers, both in-store and online. Keep your eyes pealed and your radar primed come late April/early May! Aww. He'd look great right next to my Sonic doll. ROFL! GF & I have the 2 (1 big & 2 smalls) Powered Up MegaMan plushies that were at arcades in 2008. Small ones were in a claw machine & big one had to be won with tickets. It's funny since he looks odd yet tag has official logo and says licensed by Capcom. So cute, I want one. Oh wow. I will have one and I WILL hug him! 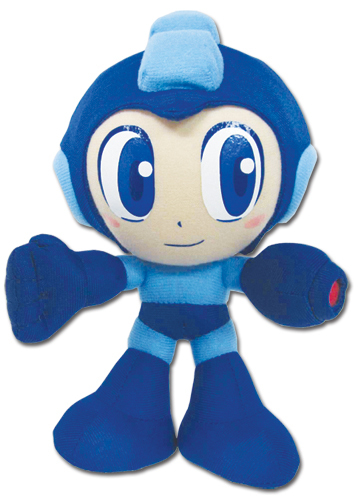 I really didn't care for Mega Man Powered UP, but as a plush, he really works. I want this lil' guy! I hope they also make a protoman plush to go with the megaman since he was also in the powered up game. I seriously hope they do some plushies from the X series. Anon-who-wants-a-Forte-plushie back again, just to point out that Yes Animation is listing the price of this plush as being $14.99 - http://www.yesanimation.com/meman10meman10.html .